I’ve put off doing this easy summit for quite a while, primarily because it’s “easy.” It’s a bit of a drive from my home, too, at around 45 minutes. But finally, on this 4th of July holiday, I decided I’d get this and a couple of other easy summits done. I started from my house at around 0515, to make it to the trailhead as the sun was coming up. The timing couldn’t have been better. 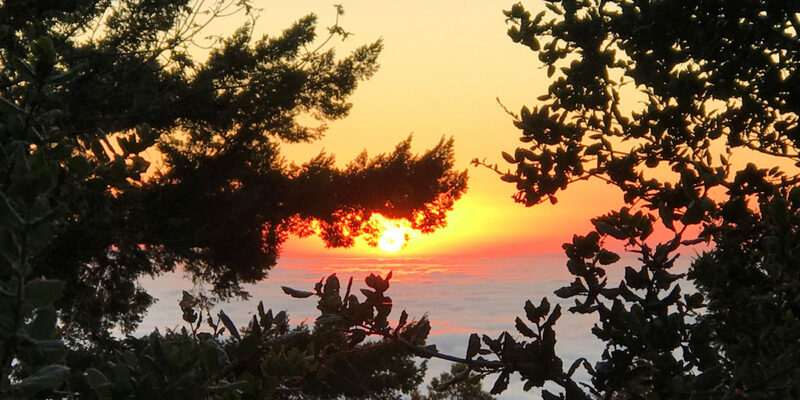 After a pleasant drive up the windy roads through the marine-layer clouds, I pulled into Skeggs Point Parking Lot and was immediately rewarded with a view of the rising sun over the clouds below. From the parking lot, it’s not immediately obvious where to go. Walk north along the highway, then (carefully) cross once you see the trailhead on the other side. It’s only about 50 yards away. Here, you can either go straight up the paved road, or take the trail next to it, which then joins back up with the paved road. Either way, keep going uphill. You’ll shortly arrive at a gate where the paved road turns to dirt. Next time I do this activation, I’d probably just set up just off the trail right around here. There’s no need and no benefit from going to the actual summit, other than to say that you’d gone to the actual summit. However, I decided to continue around the bend to another spot that looked like it was a road at some point. This climbs another 20-30 feet to the summit. After hiking trough some tall grass and pushing through some tree branches, I was in a small clearing on the summit. After some futzing about, I managed to throw my end-fed wire over a tree branch. Since this wasn’t one of my “fast and light” operations, I had my new Weaver 12oz throw weight. I tied it to the end of the para-cord attached to my wire, and had it up about 40 feet after a few throws. That thing really wants to sail when thrown, so I wouldn’t be surprised if I could get it up 50 feet or more. I recently re-built the SWR indicator part of my antenna matching unit, and haven’t been able to extinguish the LED (indicating 1:1 VSWR) when tuning. I don’t know if it’s because I’m deploying the antenna higher than when I cut it, or if the indicator isn’t functioning correctly. But I was able to get the LED to noticeably dim, and that seemed to be enough to indicate good SWR on my radio. Most importantly, the setup worked and I was able to get contacts. When I was pushing through the trees, and when I started setting up, I noticed there were quite a few bugs. It didn’t take me long to realize a lot of them were mosquitoes. I put a repellent bracelet on my wrist, and another on my backpack. This was not enough to keep them away. The whole time I was operating, they were attacking. Note to self: bring bug net and/or DEET spray next time. This early in the morning, it seems, contacts are a little bit hard to come by, possibly due to a combination of propagation characteristics, and people being awake. Also, much of the 40 meter voice sub-band is often dominated by broadcast stations from across the Pacific. Challenging. But I was able to get the 4 contacts needed and wrap it up. I probably would have gone for more, had I not been under attack by mosquitoes and wanting to get 1-2 more summits done before mid-morning. I had the MFJ Long-Ranger 2-meter telescopic antenna attached to my VX-2R, but was not able to raise any stations on 146.52, despite the proximity to the SF Bay Area. I think most people were still asleep! Overall, this was a good activation. No major complications. I suppose it would be nice to have a view of something other than the trees, so for that reason, and another I’m about to describe, I think I’ll find a different activation spot for future trips. On the way up, I saw this fence and sign, but didn’t realize it related to the summit area. It says “Area Closed / Resource Protection Area.” This was not on the trail that took me to the summit clearing, but it is another route to the summit area. It’s not trespassing, but I feel it’s advisable to heed signs like this. I won’t be going to the summit clearing again as long as this sign is here. It’s possible they’re just trying to discourage people from partying and trashing the summit clearing, which would explain why the other path to the summit isn’t blocked by anything other than naturally growing tree branches, but nonetheless, I’ll stay out. The easiest thing to do would be to hike up the road to the clearing just past the gate, set up an antenna just off the trail, and enjoy the wildlife.